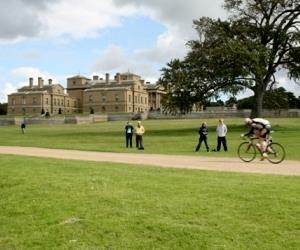 Holkham byCycle01328 713111work Cycle HireExplore the deer park and traffic-calmed trails that complement the glorious setting of Holkham Hall and its Bygones Museum. Around 10 miles of cyclefriendly trails... and a superb café and gift shop. Great for all ages. Or try our fantastic variety of quiet lane routes... visit the atmospheric seaside port of Wells-next-the-Sea, ponder the Burnham Thorpe birthplace of Lord Nelson, the tranquillity of Binham Priory, the poetic setting of East Anglia's largest Iron Age fort at Warham, the ruins of North Creake Abbey, Burnham Market (the Chelsea of Norfolk), or historic Little Walsingham with its world-famed shrine and a narrow gauge railway.